I have to say, after two days of walking the halls at HIMSS and attending social functions in the evening, my feet were tired this morning. Nevertheless, I took my cocktail of four ibuprofen, two Tylenol, and a Pepcid and headed back to do it all again. I spotted this sweet ride in the parking lot behind the Hyatt. Today’s schedule included a couple of meetings with vendors who attend HIMSS but don’t have booths. It’s always a challenge to find quiet meeting space. We used the meeting area outside the HIMSS Bistro, which was nearly empty at 11 a.m. Speaking of HIMSS Bistro, I can’t wait to hear Lorre’s recap of the CMIO luncheon yesterday. She always takes good notes on the discussion so we can share what CMIOs and clinical informatics folks are thinking as they attend HIMSS. I noticed lots of vendors sporting their HIStalk sponsor signs today. Thanks to all of you, especially HBI Solutions, Harris Healthcare, Wellsoft, Nordic Consulting, Kyruus, Datica, and Medicity. DrFirst also had their sign out and I stopped in to see their secure texting solution, which is configured as a patient-centered chat. My booth crawl BFF this afternoon said she thought this giveaway pen looked like me until I pointed out that the physician doesn’t appear to be wearing a shirt. I took a deeper look at several vendors, including Jellyfish Health, which has solutions to make anywhere the waiting room. My urgent care practice has an online registration and queuing system, but it’s not entirely reliable. I was impressed by what I saw at Jellyfish Health, but we’ll have to see what the COO thinks. LogicStream Health was showing demos and data from their solutions, which really caught my interest since driving clinician behavior is going to be a big part of organizational success under healthcare reform. 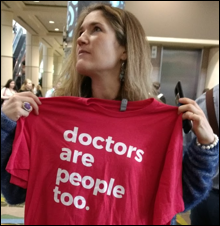 One of my booth crawling pals today is attending her first HIMSS, and was dedicated to seeking out the wildest swag to take home to her granddaughters. She scored at CompliancePoint, who was giving out flashing LED eyeglasses. We were more impressed by the shirt that Bonny Roberts picked up at Banyan. I wish I had seen it before the hall closed so I could snag one myself. I also spent a bit of time cruising the hall with @techguy John Lynn. I’m sorry I missed out on the salsa dancing at the New Media Meetup last night, but I learned he knows a thing or two about country western dancing, so I’m hoping a country-themed meetup is in the works. I’ll break out my boots for sure. He was able to talk me off the ledge when I saw this rounding cart from Omnimed, which caused some bad flashbacks to medical school. I haven’t seen paper charts in a hospital in years, but the rep told us people are still buying them, although with a better top surface to hold a laptop. They also have an IV pole that holds an iPad. We stopped to talk to Travis Good, MD at Datica, particularly about the company’s rebranding from Catalyze. It takes quite a bit of effort to research potential names, investigate securing web domains, and starting the process for trademark protection. Travis mentioned he thought warm cookies would be a great addition to the booth, and then the discussion turned to pizza. Vendors, take note for next year — you can’t underestimate the power of pizza. As far as other booth draws, Mimecast had Nerf guns where you could take aim at ransomware, but the line to take a turn was long, which is an interesting commentary. SecureIdeas had a great tagline about being “professionally evil” to protect systems from real evil. Quite a few vendor people were heads-down on their phones and others were just throwing their giveaways at passersby so they didn’t have to ship it home. The rep at Retarus global messaging told us to take what we wanted because “everything must go” and didn’t even ask us what we do or what we’re looking for at the show. I traded booth crawl partners and spotted some more people in white coats at Marco Inc. and Carepoynt. Why, oh why, does that continue? On the positive fashion side, booth staff at Cerner were wearing the most beautiful orchid-colored sweaters. The interesting giveaway of the day was at MAD Security, whose offering was a bottle of Macallan 12 scotch. 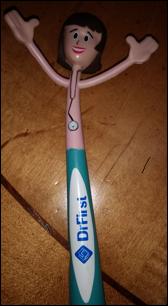 Several vendors were giving out insect repellent this year, including Healthcare Informatics (lemon/rosemary oil) and Battelle with what they were calling their “Zika Pen.” They engaged us by saying, “We’re the biggest company you’ve never heard of,” and after checking out their website, I have to say they’re quite the interesting vendor. We spotted more funny name badge ribbons at AbbaDox and I snagged a couple for next year. As the show wound down, many vendors began tearing down their booths while people were still walking through. I headed out for a quick drink with some old friends and we ran into Nick van Terheyden @drnic1, who asked if we were headed to the Harry Potter event. Although it was pouring rain at the time, he said he really wanted to go so he could get a wand – because that’s the only thing that will fix healthcare. On that note, I closed out HIMSS17. Back to the hotel for packing, blogging, catching up on 200+ emails, and getting a little rest before Disney’s Magical Express whisks me back to the airport.